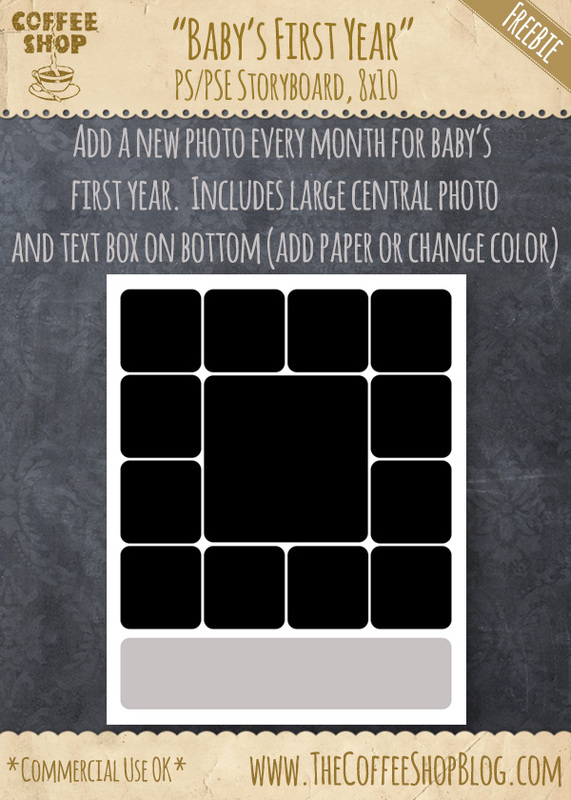 Over the years I have had so many requests for a baby's first year storyboard with clipping masks for 12 small images (one for each month), a large central image, and an adjustable text box. So this weekend I decided to finally design one. Of course, this template is not just for babies, use it for any of your images. It would be really gorgeous for a wedding or travel storyboard or to highlight your favorite children or pet photoshoot. This storyboard can be printed 8x10 or posted on the web and is completely customizable. The text box's color and storyboard background can be changed to any color or you can add some pretty digital paper or texture. Download the CoffeeShop "Baby's First Year" Storyboard. You can also download it here. I don't but I should so this! Thank you for the idea!!!! I love everything on your blog! Thank you for your generosity! My 9 year old son is crazy for baseball cards and I want to make one of him. Thank you for the templates. They are awesome.